Rose Quartz and Serenity (Look 27). I always love how last year's colors: Rose Quartz (baby pink/blush) and Serenity (baby blue/sky blue) pair together. These pastel tones go so well with each-other and this outfit proves it. I paired my Blush Pink Skinny Jeans with my newest Chambray Shirt. 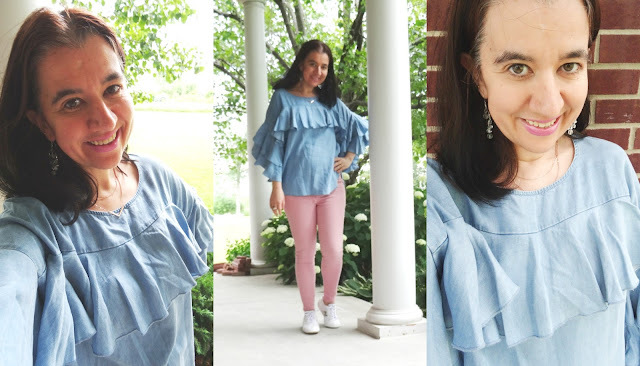 This Chambray top combines so many feminine current trends: big ruffles and bell sleeves and it is by Lauren Conrad's line at Kohl's. Since it was a day of errands for me and Vivian (shopping, grocery shopping and treating ourselves to California Pizza Kitchen for dinner) on a Sunday afternoon, I wore some Comfortable White Sneakers and these New Balance kicks are pretty, not just comfy. Hope you all enjoyed your weekend and have a great last week of July, coming up! Vivian was rocking all her butterflies! Navy, Long-Sleeve "Free" Butterfly Graphic Tee: Old Navy. Blue Ombre Silky Butterfly Hair Barrettes: Cat & Jack via Target (New). 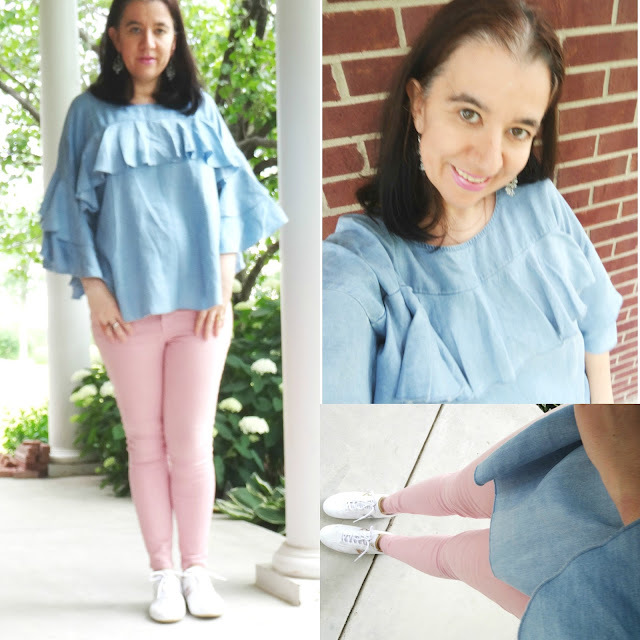 Light Wash, Soft Chambray, 3/4-Sleeve, Ruffled Blouse: LC Conrad via Kohl's (New) (identical, on Huge Sale, love it! ), (very similar darker wash, Great Deal, my Favorite), (gorgeous cold-shoulder option, Steal, love this), (similar sleeveless option, Great Deal, my Favorite), (similar off-shoulder option, Small Splurge). Silver-Tone Beaded, Light Chandelier Earrings: White House Black Market (similar, Huge Steal), (similar tiered option, Steal, love these), (gorgeous fancy option. on Huge Sale, my Favorite), (gorgeous option w/ pearls, Small Splurge, love these). White Leather Perforated Sneakers w/ Gold "N" Logo: New Balance (similar current option, love these), (similar NB option, on Sale, love these), (similar, on Sale), (similar, Splurge, my Favorite).